Lot Detail - Sidney Crosby's 2005-06 Pittsburgh Penguins Game-Worn Rookie Season Jersey with Team LOA - Photo-Matched! 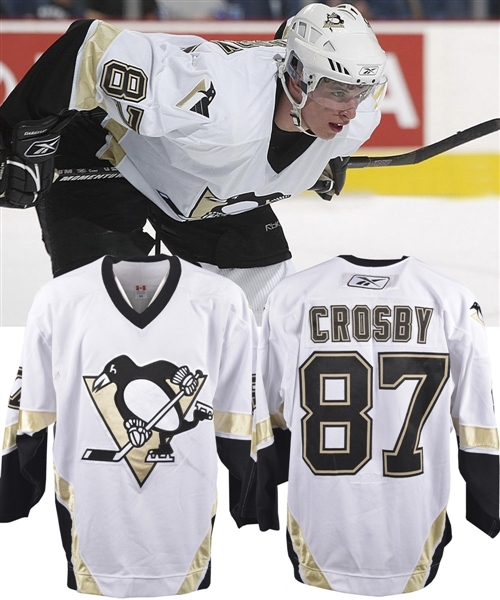 Sidney Crosby's 2005-06 Pittsburgh Penguins Game-Worn Rookie Season Jersey with Team LOA - Photo-Matched! A three-time Stanley Cup champion who has already cemented his place in history as one of the game’s all-time greatest, Sidney Crosby has secured literally every important award and trophy during his remarkable career thus far, including the Conn Smythe, Art Ross and Hart Memorial. Hailing from his rookie season in 2005-06 where he amassed an impressive 102-points, we have a Penguins jersey worn by the superstar, with this important historic garment photo-matched for assured authenticity. A label with “54” sizing is affixed to the collar, with an embroidered Reebok crest placed over a CCM example on the reverse neckline. Styled with the Penguins team crest in use from 2002 to 2016, the solid white V-neck feature’s oversized and textured tackle twill sleeve and verso numbers, with “Crosby” over the affixed nameplate in matching material. The jersey has been photo-matched to both a preseason game (Sept. 29th 2005) and to a regular season contest on Oct. 10th where Sidney registered an assist (4th regular season game). We should also note small pinholes are visible including over the middle section of each sleeve, with these most likely from a past framing/mounting of the jersey. The team patch sits over the inside hem with text that states “Sydney (spelling incorrect) Crosby’s jerseys are exclusively customized for the Pittsburgh Penguins by Cutting Edge Sports for Steve Latin”, along with “2005 #1 Draft Choice”. An LOA from the Penguins will accompany. Regarding use, a pair of large stick marks along with a few additional dark marks are visible near the team crest, with faint board burns over the right elbow. There is also a thin slit over the left shoulder, along with a few other random marks. Getty Image #55827808 (September 29th 2005 preseason game) has been matched to; the small white thread and loose gold thread in the lower interior "square" of "8" over the reverse, the tiny black mark within in the gold section on the left side of the reverse "7", and the loose black thread on the top of the Reebok logo patch which is applied over what appears to be a CCM patch. This is followed by Getty Image #55827877, also from Set 29th, with this image matched to; the small white threads on the top left corner of the "7" on the left sleeve, the two small black marks in the upper right corner of the "7", and the particular details of the junctions of the sewing lines above "87" on the left sleeve. The final preseason Getty Image #55855323 from Sept 29th has been matched to; the small white threads on the top left corner of the "7" on the left sleeve, the two small black marks in the upper right corner of the "7", to the particular details at the junction of the sewing lines above "87" on the left sleeve, the black loose thread on the top of the Reebok logo patch which is applied over the CCM patch, the small white thread and loose gold thread in the lower interior "square" of the reverse "8", and the tiny black mark within the gold section on the left side of the reverse "7". The matches from the Oct 10th contest include Getty Image #55893885, which has been matched to the small white threads on the top left corner of the "7" on the left sleeve, and to the two small black marks in the upper right corner of the "7", while Getty Image #55925819 has been matched to the two loose black threads on the team crest hockey stick blade. Finally, Getty Image #55893825 has been matched to the washed-out black mark over the right shoulder.